One of my new favorite blog is The New Rockstar Philosophy written by Hoover and Voyno. They cover a myriad of topics related to the state of the music business. Each post has a perfect mix of snark and information, Just the way I like them. A few days ago Hoover contacted me and asked if I would like to do a “blog interview” on being a Music Supervisor and how to counsel anyone who wants to license music to Film/TV or Ads. Naturally I was thrilled. Check it out, and add TNRP to your blogroll! Multiple use for Ads for Music – is it used enough? or even well? Instead, what do we get? A head shot begging to magic marker a good old-fashioned “balls on the chin” on Courtney’s visage (don’t forget the eyepatch and the blackened teeth there, Picasso). What I’m trying to illustrate is that these days nothing, and I mean nothing, should ever be created for single-use. With the viral capabilities of the web, every single piece created should be used and re-used to promote your product, from the album art to the t-shirt to the banner ad to the show itself. Every single touch point for your artist should have a takeaway viral marketing aspect — single song streams should be embeddable, trackable; official pix & videos should have your URL in the bottom right; every show should have the band’s name in a backdrop or at least on the bass drum head; t-shirt designs should have the band’s name legible from a satellite, as well as have easter eggs hidden in the imagery. As crass as it is, I’d have a kid dressed in Bowling 4 Soup’s “My Wena” (totally NSFW, btw) phallus costume, taking pictures at the merch booth with fans two hours before the show, and then letting the kids download the pix from the Bowling for Soup site in exchange for their email address! Food for thought: The iPhone is the #1 camera used on Flickr; in 10 months, the iPhone will be the #1 camera used on YouTube. What are you doing to take advantage of this trend? You WANT your fans to take pictures & audio & video and pass it along to their friends. Not every show should be an aliens-and-confetti cannon extravaganza like the Flaming Lips, but give your fans something to talk about. But speaking fan-to-fan, I’d be remiss in not saying this to EVERYBODY (I’ll admit, I’m just as guilty): you ain’t Scorsese, and this ain’t ‘The Last Waltz’. After the first two songs, quit taking pictures of you and your girlfriend in front of the stage. Put down the camera, pick up the beer, and just enjoy the freakin’ show, okay? I love Scott’s Post for so many reasons. The word ARTIST in his post could be easily replaces with CLIENT and applied to advertising, but this is precisely where Music and Advertising are linked. As creatives in the Music and Advertising business, we must think ahead, be more clever and not so myopic. “This is a TV ad,” or “this is only outdoor advertising” just wont cut it anymore. There have been a few great examples lately. One I remember was a kiosk attatched to a bus stop for Target. 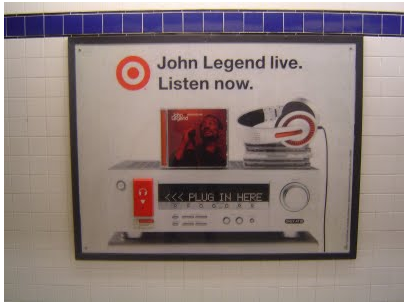 You could plug your headphones into the wall to listen to John Legend’s new record. SMART. Another direct example of the Ad industry point of view would would be common acceptance for “this is only music for my ad.” Let’s face it, Agencies and by proxy, clients spend a lot of money on music, be it Original or Licensed; you should get more out of it. But as any of us in the Commercial Production world know, that would take a lot of forethought that comes in direct connection with MEDIA, and that my friends, it a whole other posting. The sooner the Ad biz takes cues form Scott’s post, the sooner they will be able to create more engaging ads and make thei clients money go further. It’s ain’t rocket science folks. Everyone – check out Scott’s New Music Tipsheet, it is a staple in my information highway. SXSW Panel Picker is UP!! So this year I thought I would take the Syllabus for my UCLA Class and offer it as a Workshop at SXSW. 12 weeks edited into 45 minutes. SXSW has a “Panel Picker” that allows anyone to sign in and have a vote. Its a pretty cool system. First off I want to say THANK YOU to my collegues who have logged in to vote and left comments as well. It means alot to me. No matter how trifle it may seems, to look back on 10 years of work, its an incredible feeling to that is it respected. I tip my hat. Let me know if you plan to be at SXSW this year! Recently, I have been considering both sides of the debate on social media. Is it improving our lives or making us even more A.D.D.? I don’t know, but what I do SEE are communities forming, more rapidly than ever. It is extraordinary to watch. I post question on Twitter and I get responses from people all over the world. Some of these people have become trusted filters (see The Long Tail by Chris Anderson) to me. I have been expanding and contracting my Twitter family, but this past week, I have added several companies. After I saw this I found myself smiling a very big smile. FINALLY a brand embracing the potential for Crowd Sourcing. Go on…. ask the public what they think!!! Now, from some perspectives this might put me out of a job as a Music Supervisor and Music/Brand Strategist, but it still thrills me. Market to me meaningfully corporate America, I BEG YOU. Let me first say, that in a brick and mortar, pre-internet world, this was very easy to do. Michael Jackson fit almost everyone’s ear buds, but today in a LONG TAIL world, the advertisers, marketers and brands have had a very hard time figuring out how to connect with the public. They might be missing a pretty big boat if they don’t get on board soon. See the name, look…it’s right there on the side; THE ARK. Music is a naturally sticky marketing tool; the perfect “catch net” to draw new fans to a brand, but music is also highly subjective. Much like my last blog post, I must digress to the notion of the ad communities, “We know best” mentality. Another point to the matter; FACT – the majority of the music chosen to be in ads (tv, internet) is chosen based on the likes/dislikes of the people MAKING the commercial, not on the likes/dislikes of the people BUYING the product. I never understood why. Sorry, I just don’t. Why don’t you want to choose music that you KNOW is geared towards your demographic? In a time where focus groups and demographics play an even heavier role in the life of an ad campaign, why isn’t the first criteria for a piece of licensed music on a spot the demo? Who likes this music? Who already listens to it, and will the fans of that Band be a potential new fan of our brand? Today I saw the first little sprout from @PepsiMusic. Arguably one of the biggest brands in the world, which historically would put them in the “last one to change” category. So lets watch together as Pepsi embraces the opinion of Twitter’ers around the world to tell them who they should broadcast on behalf of their brand. Go forth, build communities, and then have the sense to LISTEN to them. Who Actually Cares about the Ads You Make? A few nights ago, as I was reading through my backed up RSS feeds, I received an email from American Airlines; “Your friend Jennifer has asked that you watch this film!” The promotion was a 150 second film about the new “Flex Miles Program” for redeeming miles online. It was hideous visually. My 5 year old could have created it in Keynote. I actually rolled my eyes a few times, but I sat through the entire video and then went on to add my own “recommend this to a friend” in order to receive my OPPORTUNITY TO WIN A SHARE OF ONE MILLION MILES. A nebulous promise, but nonetheless I was set on completing the task no matter how bad this film looked. In this day and age, who doesn’t want extra miles? Upon completion of this promotion, I quickly shot off an email to my friend Jennifer thanking her for sending the email my way and lastly commenting on how terrible the ad was. She agreed. The video was great, and I applaud an Agency for branching out to new avenues of work and also for using the company’s creative talents to help Bands and Artists, but it was the Ad Critic comment that got me. Why does Ad Critic mean so much to our industry? What is more important to the overall success of this music video; it’s rank on Ad Critic or aiming for critical mass on You Tube hits? This was a great example of exactly what Jeff Goodby had so boldly stated. Advertising is defined (by Webster’s Dictionary) as: the action of calling something to the attention of the public especially by paid announcements. Then shouldn’t the success of an ad be judged on how many people it reached rather then industry accolades? Let’s go back to the American Airlines online Ad. Very average visually, but it worked. Jennifer watched it, I watched it and my mom watched it. Mission accomplished. By definition this was a GREAT ad, regardless of my aversion to the visuals. “Our video made #16 on Ad Critic.” “How?” your client asked. “We submitted it to Ad Critic and a bunch of other Ad people voted it forward. (SFX – screeching of brakes)………….. lets try this again. “Our video got over ONE MILLION hits on You Tube in the first week.” “How?” your client asked. I love great creative and a well-produced ad as much as anyone in our business, but more than that I have come to appreciate an ad that works. Mr. Goodby, I’m with you. It’s happening whether you believe it or not. The bridge to our island of Commercial Production has crossed the moat and hit land on the other side. Information is being shared with everyday people. OH MY GOD!!! SECURITY HAS BEEN BREACHED! Hardly. Maybe even more shocking, people outside our industry care! In an effort “to be heard” or to raise awareness, Agency Creatives from all over our industry have joined the global community of TWITTER to talk to, well, everyone. Its fantastic. I am having more meaningful conversations with the Agency world than ever before, and I have not picked up a phone to call them in over 6 months. It is high time that the Commercial Production community starts a conversation with the world. The good news is you have a much bigger audience to talk to. The bad news is, chatting it up about kids, sales trips and the state of the business ain’t gonna cut it anymore if you want to snake that board from an A-List Director who is available. A good friend of mine forwarded me a fantastic article on Mashable yesterday about Directors on Twitter. In less than 5 hours over 5,000 people from all over the world hit this link. I would say that this is convincing evidence that the public is interested in what Directors have to say! So why aren’t more Directors talking to the public? “Because that’s just not the way we do things,” is one answer I got. “We are doing just fine,” was another answer I got. Now all of these are Film and TV Directors, granted…..but isn’t cross pollination and raising the celebrity of Directors, of the talent you breed and cultivate what it’s all about? Here is the main point folks: If you can gets thousands of people online to care about your Director and what he or she says then it’s gonna be alot easier to get a Creative Director’s attention. Directors of commercials are the Film industry’s unsung heros. They bring ideas to life. Do they get credit on the Super Bowl Credits? No. Will the Agencies ever promote them? Probably not. But the Production Companies and Sales Teams can, and it just might pay off. Does the general public know how funny Randy Krallman is? Or how Fredrik Bond’s amazing mind works? No. Do they want to know? Yes. I consider myself one of the lucky ones to work with this very talented group of men and women. A veritable brotherhood of Artists and Bands that have created one of the best Indie music brands of the last 10 years; Ghostly International. From the moment I saw that little ghost, I was hooked. I have represented their catalog for licensing in ads since 2001, and when I first sat down with Sam, he told me in no uncertain words that he was going to make Ghostly into a luxury brand. I have to be honest, I thought he was a little delusional. But not even a year later, I had an Interior Design Magazine placed in front of me, and what was in it? GHOSTLY. One of the first Record labels to sell music on a flash stick. But not just any old flash stick, but a perfectly designed and packaged one. So perfect that MOSS in Soho carried them and an editor for Interior Design was blown away. So I had to eat my words. Gladly. 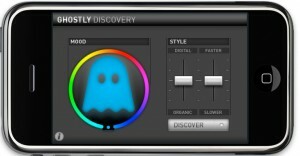 Today I am very proud to help introduce the Ghostly DISCOVERY iPhone App to the world. This tool has set the bar for labels everywhere. They have named this App well – it is the most fantastic Discovery tool. If you don’t know anything about this label – why not- download the App, it’s free. Mood is set by choosing a color and following the circle with your finger to draw the color down to the dot – that sets the color of the Ghost. Toggle the white bars under STYLE to get music that is more/less digital or more/less faster. You can listen to the entire track and then go straight to iTunes to buy it. You can get additional info on each artist, listen to streaming Ghostly Music…. Its Ghostly in your pocket. Just as everyone begins to murmur that even Indie Labels have lost their luster; lost their ability to influence, sell and promote music, Ghostly hits it right on the nail. Clean functional technology, music and well, the iPhone. For all you Blackberry people out there. So Sorry. I guess they have proven that creativity and great design = luxury. I have had some incredible speakers so far this semester. Landis Smithers: “Don’t do things the same way everyone else does if you want to stand out; the last recession I found myself looking for a job. When I looked closely I could see that everyone was sending resumes in the sasme white mainla envelopes. So I sent mine in oversized red and got an almost 100% retention rate. Looks matter when it comes to sending music to Advertising Creatives. It’s been a great semester so far. I remain excited about providing Artists and Artists reps valuable skills to help them navigate these shark invested waters (Answer: knowledge) by showing them what has been typically shrouded and reserved for the Labels, Publishers and Reps. And by the way it took some of the aforementioned years to figure it out as there were no formal resources. Stay tuned for more as the semester unfolds. Look out Big Apple – I am coming back! 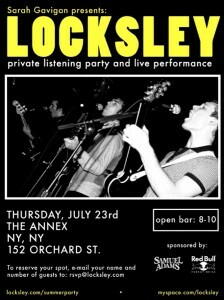 The Band Locksley has been cool enough to bring me to NY to help them make some noise to the Advertising community about their new record. We will be throwing down at the Annex from 8:00-11:30pm. Open bar is 8-10pm. If you want to come and have not received an invite – hit me with an email. This party is for the Ad Industry only. What's new with my scene…. Well after an almost 10 year run with Ten Music, I am saying goodbye to the brand and striking out on my own. I was honored to work with some fantastic people during the last 9 years, but is time to look only to myself for the future. Since September, there has been a tremendous amount of uncertainty, not only for me, but with the business at large. The last nine months have given me a chance to re-evaluate where the business of music in advertising is going. This blog and website will be a reflection of my life in the advertising and music industries, my opinions, the jobs I work on, anything having to do with my professional life as a Music Strategist in the Advertising and Marketing world.